For his son, see William T. Mahone Jr.
William Mahone (December 1, 1826 – October 8, 1895) was an American civil engineer, railroad executive, Confederate States Army general, and Virginia politician. As a young man, Mahone was prominent in the building of Virginia's roads and railroads. As chief engineer of the Norfolk and Petersburg Railroad, he built log-foundations under the routes in the Great Dismal Swamp in southeast tidewater Virginia that are still intact today. According to local tradition, several new railroad towns were named after the novels of Sir Walter Scott, a favorite British/Scottish author of Mahone's wife Otelia. In the American Civil War, Mahone was pro-secession and served as a general in the southern Confederate States Army. He was best known for regaining the initiative at the late war siege of Petersburg, Virginia while Southern troops were in shock after a huge mine/load of black powder kegs was exploded beneath them by tunnel digging former coal miner Union Army troops resulting in the Battle of the Crater in July 1864; his counter-attack turned the engagement into a disastrous Union defeat. After the war, he returned to railroad building, merging three lines to form the important Atlantic, Mississippi and Ohio Railroad (AM&O), headquartered in Lynchburg. He also led the Readjuster Party, a temporary state political party with a coalition of freemen blacks, Republicans and populist Democrats, and was elected by the commonwealth General Assembly to the U.S. Senate in 1881. His willingness to caucus with Republicans cost him some support from the white electorate, as did his relatively tolerant treatment of African-American freemen. William Mahone was born at Brown's Ferry near Courtland in Southampton County, Virginia, to Fielding Jordan Mahone and Martha (née Drew) Mahone. Beginning with the immigration of his Mahone ancestors from Ireland, he was the third individual to be called "William Mahone." He did not have a middle name as shown by records including his two Bibles, Virginia Military Institute (VMI) Diploma, marriage license, and Confederate Army commissions. Likewise, the General and Otelia's first-born son was christened William Mahone. The suffix "Jr." was added to his name later in his life, during a period of similar cultural naming transitions in Virginia. The little town of Monroe was on the banks of the Nottoway River about eight miles south of the county seat at Jerusalem, a town which was renamed Courtland in 1888. The river was an important transportation artery in the years before railroads and later highways served the area. Fielding Mahone ran a store at Monroe and owned considerable farmland. The family narrowly escaped the massacre of local whites during Nat Turner's slave rebellion in 1831. The local shift of transportation in the area was from the river to the new technology emerging with railroads in the 1830s. In 1840, when William was 14 years old, the family moved to Jerusalem, where Fielding Mahone purchased and operated a tavern known as Mahone's Tavern. As recounted by his biographer, Nelson Blake, the freckled-faced youth of Irish-American heritage gained a reputation in the small town for both "gambling and a prolific use of tobacco and profanity." Young Billy Mahone gained his primary education from a country schoolmaster but with special instruction in mathematics from his father. As a teenager, for a short time, he transported the U. S. Mail by horseback from his hometown to Hicksford, a small town on the south bank of the Meherrin River in Greensville County which later combined with the town of Belfield on the north bank to form the current independent city of Emporia. He was awarded a spot as a state cadet at the recently opened Virginia Military Institute (VMI) in Lexington, Virginia. Studying under VMI Commandant William Gilham, he graduated with a degree as a civil engineer in the Class of 1847. Mahone worked as a teacher at Rappahannock Academy in Caroline County, Virginia, beginning in 1848, but was actively seeking an entry into civil engineering. He did some work helping locate the Orange and Alexandria Railroad, an 88-mile line between Gordonsville, Virginia, and the City of Alexandria. Having performed well with the new railroad, was hired to build a plank road between Fredericksburg and Gordonsville. On April 12, 1853, he was hired by Dr. Francis Mallory of Norfolk, as chief engineer to build the new Norfolk and Petersburg Railroad (N&P). William Mahone, chief Engineer, advertised for contractors who would regrade the Norfolk and Petersburg Railroad for 62 miles from the Warwick Swamp to Norfolk in 1853. Mahone's innovative 12 mile-long roadbed through the Great Dismal Swamp between South Norfolk and Suffolk employed a log foundation laid at right angles beneath the surface of the swamp. Still in use over 160 years later, Mahone's corduroy design withstands the immense tonnages of modern coal trains. He was also responsible for engineering and building the famous 52 mile-long tangent track between Suffolk and Petersburg. With no curves, it is a major artery of modern Norfolk Southern rail traffic. In 1854, Mahone surveyed and laid out with streets and lots of Ocean View City, a new resort town fronting on the Chesapeake Bay in Norfolk County. With the advent of electric streetcars in the late 19th century, an amusement park was developed there and a boardwalk was built along the adjacent beach area. Most of Mahone's street plan is still in use in the 21st century as Ocean View, now a section of the City of Norfolk, is redeveloped. Mahome was also a surveyor for the Norfolk and South Air Line Railroad, on the Eastern Shore of Virginia. On February 8, 1855, Mahone married Otelia Butler (1835 – 1911), the daughter of the late Dr. Robert Butler from Smithfield, who had been State Treasurer of the Commonwealth of Virginia from 1846 until his death in 1853. Her mother was Butler's second wife, Otelia Voinard Butler (1803–1855), originally from Petersburg. Young Otelia Butler is said to have been a cultured lady. She and William settled in Norfolk, where they lived for most of the years before the Civil War. They had 13 children, but only three survived to adulthood, two sons, William Jr. and Robert, and a daughter, also named Otelia. From 1862 to 1868, the family resided in Clarksville, Virginia at the Judge Henry Wood Jr. House. The Mahone family escaped the yellow fever epidemic that broke out in the summer of 1855 and killed almost a third of the populations of Norfolk and Portsmouth by fleeing the city and staying with his mother 50 miles away in Jerusalem (now known as Courtland) in rural Southampton County. However, because the epidemic decimated the Norfolk area, with financial consequences as well, work on the new railroad to Petersburg almost came to a standstill. Ever frugal, Mahone and his mentor, Dr. Mallory, nevertheless pushed the project to completion in 1858 and Mahone was named its president a short time later. Popular legend claimed Otelia and William Mahone traveled along the newly completed railroad naming stations from Ivanhoe and other books she was reading written by Sir Walter Scott. From his historical Scottish novels, she chose the place names of Windsor, Waverly, and Wakefield. She tapped the Scottish Clan "McIvor" for the name of Ivor, a small Southampton County town. When they reached a location where they could not agree, Disputanta was created. In 1860, census records showed that Mahone owned seven African-American slaves: three male (ages 13, 4, 2) and four female (ages 45, 24, 11, 1). Nevertheless, during the Civil War and after, he showed an empathy for former slaves that was atypical for the times, and worked diligently for their fair treatment and education. As the political differences between Northern and Southern factions escalated in the second half of the 19th century, Mahone was in favor of secession of the Southern states. During the American Civil War, he was active in the conflict even before he became an officer in the Confederate Army. Early in the War, in 1861, his Norfolk and Petersburg Railroad was especially valuable to the Confederacy and transported ordnance to the Norfolk area where it was used during the Confederate occupation. By the end of the war, most of what was left of the railroad was in Federal hands. After Virginia seceded from the Union in April 1861, Mahone was still a civilian and not yet in the Confederate Army, but working in coordination with Walter Gwynn, he orchestrated the ruse and capture of the Gosport Shipyard. He bluffed the Federal troops into abandoning the shipyard in Portsmouth by running a single passenger train into Norfolk with great noise and whistle-blowing, then much more quietly sending it back west, and then returning the same train again, creating the illusion of large numbers of arriving troops to the Federals listening in Portsmouth across the Elizabeth River (and just barely out of sight). The ruse worked, and not a single Confederate soldier was lost as the Union authorities abandoned the area and retreated to Fort Monroe across Hampton Roads. After this, Mahone accepted a commission as lieutenant colonel and later colonel of the 6th Virginia Volunteer Infantry Regiment, and remained in Norfolk, which was now under the command of Benjamin Huger. Mahone was subsequently promoted to brigadier general on November 16, 1861 and commanded the Confederate's Norfolk district until its evacuation the following year. In May 1862, after the evacuation of Norfolk by Southern forces during the Peninsula Campaign, he aided in the construction of the defenses of Richmond on the James River around Drewry's Bluff. A short time later, he led his brigade at the Battle of Seven Pines, and the Battle of Malvern Hill. After the defense of Richmond, Mahone's brigade was assigned from Huger's division, to the division of Richard H. Anderson and fought at the subsequent battle of Second Bull Run, where Mahone was shot in the chest while leading his brigade in a charge across Chinn Ridge. Small of stature, 5 feet 6 inches (168 cm), and weighing only 100 pounds (45 kg), he was nicknamed "Little Billy". As one of his soldiers put it, "He was every inch a soldier, though there were not many inches of him." Otelia Mahone was working in Richmond as a nurse, when Virginia Governor John Letcher sent word that Mahone had been injured at Second Bull Run, but had only received a "flesh wound." She is said to have replied "Now I know it is serious for William has no flesh whatsoever." The wound was not life-threatening, but he missed out on the Maryland Campaign the following month. He returned to command after two months of recuperation, not seeing any major action at the Battle of Fredericksburg. Mahone used his considerable political skills to lobby for a promotion to major general during the winter of 1862-63. Although several of his fellow officers in the Army of Northern Virginia agreed, Robert E. Lee argued that there was no available position for a major general just then, and Mahone would have to wait until one opened up. Mahone's brigade was one of the portions of Longstreet's corps that remained with the main army for the Battle of Chancellorsville. After Lee reorganized the army in May 1863, Mahone ended up in the newly-created III Corps of A.P. Hill. At the Battle of Gettysburg, Mahone's brigade was mostly unengaged and suffered only a handful of casualties the entire battle. He was supposed to participate in the attack on Cemetery Ridge on July 2, but against orders, held his brigade back. During Pickett's Charge the following day, Mahone's brigade was assigned to protect artillery batteries and did not get involved in the main fighting. Mahone's official report for the battle was only 100 words in length and gave little insight as to his actions on July 2, although he told fellow brigadier Carnot Posey that division commander Richard H. Anderson had ordered him to stay put. Despite his failure to move his command into action, Mahone suffered no punishment due to his seniority and the fact that he would ultimately become one of a handful of officers in the Army of Northern Virginia to lead a brigade for an entire year's duration. Although his wound at Manassas had not been serious, Mahone did suffer from acute dyspepsia all of his life. During the war, a cow and chickens accompanied him in order to provide dairy products. Otelia and their children moved to Petersburg to be near him during the final campaign of the War in 1864-65 as Grant moved against Petersburg, seeking to sever the rail lines supplying the Confederate capital of Richmond. During the Battle of the Wilderness, Mahone's soldiers accidentally wounded James Longstreet. Richard Anderson was appointed to corps command, with Mahone getting command of Anderson's division, which he led for the remainder of the war, starting at the Battle of Spotsylvania Court House. He became widely regarded as the hero of the Battle of the Crater on July 30, 1864. Coal miners in the Union Army tunneled under the Confederate line and blew it up in a massive explosion, killing and wounding many Confederates and breaching a key point in the defense line around Petersburg. But Mahone rallied the remaining Confederate forces nearby, repelling the attack, and the Union lost their initial advantage. Having begun as an innovative tactic, the Battle of the Crater turned into a terrible loss for the Union leaders. The quick and effective action led by Mahone was a rare cause for celebration by the occupants of Petersburg, embattled citizens and weary troops alike. On July 30, he was promoted to major general. However, Grant's strategy at Petersburg eventually succeeded as the last rail line from the south to supply the Cockcade City (and hence Richmond) was severed in early April 1865. At the Battle of Sailor's Creek on April 6, Lee exclaimed in front of Mahone "My God, has the army dissolved? ", to which he replied "No, General, here are troops ready to do their duty." Touched by the loyalty of his men, Lee told Mahone, "Yes, there are still some true men left ... Will you please keep those people back?" Mahone was also with Lee at the surrender at Appomattox Court House three days later. After the war, Lee advised his generals to go back to work rebuilding the Southern economy. 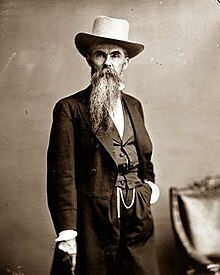 William Mahone did just that, and became the driving force in the linkage of N&P, South Side Railroad, and the Virginia and Tennessee Railroad. He was president of all three by the end of 1867. During the post-war Reconstruction period, he worked diligently lobbying the Virginia General Assembly to gain the legislation necessary to form the Atlantic, Mississippi & Ohio Railroad (AM&O), a new line comprising the three railroads he headed, extending 408 miles from Norfolk to Bristol, Virginia, in 1870. This conflicted with the expansion of the Baltimore and Ohio Railroad from Baltimore and Alexandria, Virginia. The Mahones were colorful characters: the letters A, M & O were said to stand for "All Mine and Otelia's". They lived in Lynchburg, Virginia, during this time, but moved back to Petersburg in 1872. The Financial Panic of 1873 put the A, M & O into conflict with its bondholders in England and Scotland. After several years of operating under receiverships, Mahone's relationship with the creditors soured, and an alternate receiver, Henry Fink, was appointed to oversee the A, M & O's finances. Mahone still worked to regain control. His role as a railroad builder ended in 1881, when Philadelphia-based interests outbid him and purchased the A, M & O at auction, renaming it Norfolk and Western (N&W). Before the Civil War, the Virginia Board of Public Works had invested state funds in a substantial portion of the stock of the A, M & O's predecessor railroads. Although he lost control of the railroad, as a major political leader in Virginia, Mahone was able to arrange for a portion of the State's proceeds of the sale to be directed to help found a school to prepare teachers to help educate black children and former slaves near his home at Petersburg, where he had earlier been mayor. The Virginia Normal and Collegiate Institute eventually expanded to become Virginia State University, with Virginia native John Mercer Langston returning from Ohio to become its first president. Mahone also directed some funds to help found the predecessor of today's Central State Hospital in Dinwiddie County, also near Petersburg. Mahone personally retained his ownership of land investments which were linked to the N&W's development of the rich coal fields of western Virginia and southern West Virginia, contributing to his rank as one of Virginia's wealthiest men at his death, according to his biographer, author Nelson Blake. Mahone was active in the economic and political life of Virginia for almost 30 years, beginning in the midst of the Civil War when he was elected to the Virginia General Assembly as a delegate from Norfolk in 1863. He later served as mayor of Petersburg. After his unsuccessful bid for governor in 1877, he became the leader of the Readjuster Party, a coalition of Democrats, Republicans, and African-Americans seeking a reduction in Virginia's prewar debt, and an appropriate allocation made to the former portion of the state that constituted the new State of West Virginia. In 1881, Mahone led the successful effort to elect the Readjuster candidate William E. Cameron as the next governor, and he became a United States Senator. The Readjuster Party did more than refinance the Commonwealth's debts. The party invested heavily in schools, especially for African Americans, and appointed African American teachers for such schools. The party increased funding for what is now Virginia Tech and established its black counterpart, Virginia State. The Readjuster Party abolished the poll tax and the public whipping post. Because of expanded voting, Danville elected a black-majority town council and hired an unprecedented integrated police force. With the Senate split 37–37 between Republicans and Democrats, Mahone and another third-party candidate who was willing to caucus with the latter both had political influence. Under Senate rules, Vice President of the United States Chester A. Arthur, a Republican, would cast any tie-breaking votes. Mahone bargained for significant concessions before he decided to caucus. Despite being a freshman senator, he received chairmanship of the influential Agriculture Committee and gained control over Virginia's federal patronage, both from President James A. Garfield, and by the right to select both the Senate's Secretary and Sergeant at Arms. However, Mahone still faced opposition from the Conservative Party of Virginia, which aligned with the Democrats and grew even more powerful after the 1884 election, when Democrat Grover Cleveland was elected president (with its patronage perks). Mahone maintained his Republican Party affiliation, leading Virginia delegations to the Republican National Conventions of 1884 and 1888. However, he lost his Senate seat to Conservative Democrat John W. Daniel in 1886. Moreover, John Mercer Langston began his political career in Petersburg in 1888, as a Republican criticizing Mahone for neglecting African Americans except on voting day. In 1889, Mahone ran for governor on a Republican ticket but lost to Democrat Philip W. McKinney. It was to be 80 more years before Virginia sent another non-Democrat to the Governor's Mansion (Republican A. Linwood Holton Jr., in 1969). Although out of office, the seemingly tireless Mahone continued to stay involved in Virginia-related politics until he suffered a catastrophic stroke in Washington, D.C., in the fall of 1895. He died a week later, at 68. His widow, Otelia, lived on in Petersburg until her own death, in 1911. Although Mahone was not to live to see the outcome, for several decades, Virginia and West Virginia disputed the new state's share of the Virginia government's debt. The issue was finally settled in 1915, when the United States Supreme Court ruled that West Virginia owed Virginia $12,393,929.50. The final installment of this sum was paid off in 1939. He was interred in the family mausoleum in Blandford Cemetery in Petersburg, Virginia. His widow was interred alongside him. The mausoleum is identified by his well-known monogram, an initial "M" centered on a star inside a shield. Their first home in Petersburg, originally occupied by John Dodson, Petersburg's mayor in 1851-2, was on South Sycamore Street. That structure is now part of the Petersburg Public Library. In 1874, they acquired and greatly enlarged a home on South Market Street and it was their primary residence thereafter. Virginia State University, which he helped found as a normal school, is a major community presence nearby. A large portion of U.S. Highway 460 in eastern Virginia (between Petersburg and Suffolk) parallels the 52-mile tangent railroad tracks that Mahone had engineered, passing through some of the towns that the two are believed to have named. Several sections of the road are labeled "General Mahone Boulevard" and "General Mahone Highway" in his honor. The Route 35 overpass of Route 58 in his native Southampton County, Virginia is named "The General William Mahone Memorial Bridge." A monument to Mahone's Brigade is located on the Gettysburg Battlefield. To the memory of William Mahone, Major General, CSA, a distinguished Confederate Commander, whose valor and strategy at the Battle of the Crater, July 30, 1864, won for himself and his gallant brigade undying fame. In 2017, following the violence at the Unite the Right rally around the removal of Confederate monuments and memorials, University of Chicago history professor Jane Dailey noted that Mahone remains largely uncommemorated, even forgotten, despite his military career and the high esteem in which Lee held him as a possible successor. After the end of his political career, resurgent white Democrats governing Virginia had branded him and other white members of the Readjuster Party autocratic race traitors, and as late as the 1940s, Mahone's memory was invoked to besmirch political opponents. Dailey speculates that in the process, they deliberately downplayed Mahone's role in the war to obscure the progressive policies of the Readjusters during Reconstruction. Many of the Confederate monuments and statues are currently under consideration for removal or destruction. In 2017, the Roanoke Times published an editorial about Mahone and suggested a new statue in his honor: "But here was a Confederate general who tried to build a New South and was effectively erased from history because of it. If we want to put our history in full context, we might want to put up a statue to Mahone." ^ Virginia Historic Landmarks Commission Staff (March 1979). "National Register of Historic Places Inventory/Nomination: Brown's Ferry" (PDF). Virginia Department of Historic Resources. ^ Harwood Paige Watkinson Jr., Simone A. Kiere (July 2007). "National Register of Historic Places Inventory/Nomination: Mahone's Tavern" (PDF). Virginia Department of Historic Resources. ^ a b c "Mahone, William (1826–1895)". Encyclopedia Virginia. Retrieved 2010-11-27. ^ American Railroad Journal. J.H. Schultz. 1853. p. 752. ^ John G. Zehmer and Donald S. B. Hall (April 1999). "National Register of Historic Places Inventory/Nomination: Judge Henry Wood Jr. House" (PDF). Virginia Department of Historic Resources. ^ "William Mahone". Lva.virginia.gov. Retrieved 2010-11-27. ^ "Erased from History". Editorial Board. Roanoke Times. October 21, 2017. Page 8. ^ "William Mahone | American businessman and Confederate general". Encyclopedia Britannica. Retrieved 2018-01-03. ^ "MAHONE, William - Biographical Information". bioguide.congress.gov. Retrieved 2018-01-03. ^ Dailey, Jane (August 21, 2017). "The Confederate General Who Was Erased". The Huffington Post. Retrieved August 24, 2017. ^ "Erased from History: Why Virginia ignores one particular Confederate General" Editorial Board. Roanoke Times. October 21, 2017. Page 8. Blake, Nelson, William Mahone of Virginia: Soldier and Political Insurgent Garrett and Maisie, 1935. Evans, Clement A., Confederate Military History, Vol. III (biography of William Mahone)', 1899. Striplin, E. F. Pat., The Norfolk & Western: a history Norfolk and Western Railway Co., 1981, ISBN 0-9633254-6-9. The New Method of Voting by William Mahone, The North American review. Volume 149, Issue 397, December 1889. "William Mahone". Find a Grave. Retrieved 2009-05-06. Luebke, P. C. William Mahone (1826–1895). In Encyclopedia Virginia. This page was last edited on 4 March 2019, at 22:47 (UTC).